A superb wheelbarrow perfectly capable of loading up to 85 litres with its strong plastic tray. Idel for use in the garden, stable yard, DIY and commercial areas. The strong tubular frame adds extra rigidity which makes wheeling it around on its large pneumatic wheel a breeze. 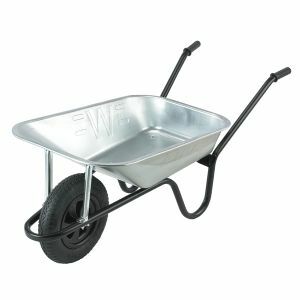 The galvanised wheelbarrow is a pneumatic wheeled barrow and is manufactured specifically for heavy duty work. We sell replacement wheels for all our wheelbarrows including the galvanised wheelbarrow along with spare inner tubes for puncture repairs. Also available with a solid wheel. Wheel colour may vary from illustration. Comes fully assembled for immediate use. This item is usually kept in stock and available for local delivery only (Northern Ireland).